Von Miller, the electrifying outside linebacker/pass rusher extraordinaire for the Denver Broncos will be serving a six game suspension to start the 2013 season due to a violation of the league’s substance abuse policy. 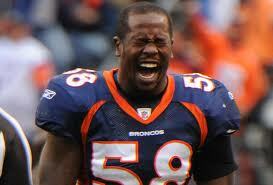 Miller has 30 sacks over the past two years. 30!!! With only two years in the league, Miller has already entered discussions about the best defensive players in football, and his tenacity clearly has positioned him as a player to fear for opposing quarterbacks. The Denver defense will struggle without him. Already down Elvis Dumerville after his bizarre departure to Baltimore, the Broncos will spend the first six weeks of the season without an established pass rusher. Robert Ayers will need to take a big step forward, and Denver will need to rely on an inside pass rush from Kevin Vickerson and rookie Sylvester Williams. The Broncos will hope that Shaun Phillips, former long-time Charger, will have the ability to help fill in for the suspended Miller, but the defensive problems could put the Broncos in trouble early on, with a hungry and improved Kansas City Chiefs team chomping at the bit to take over on top of the AFC West. Ultimately, I think the Broncos weather the six week storm, but they’re going to have to to lean a little more on offense than they’d like to. They’re lucky they have Peyton Manning and one of the league’s best groups of receivers to help them make up for the points they’ll likely give up the first few weeks.